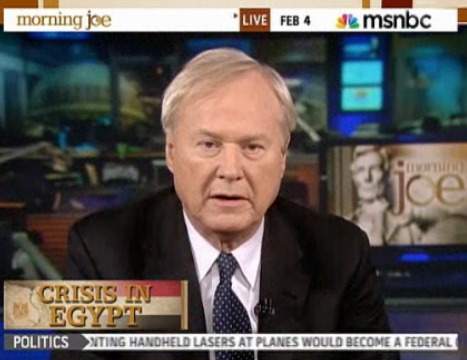 Obama's Response To Egypt Crisis Makes Chris Matthews "Ashamed As An American"
Every once in a while when Chris Matthews isn’t idiotically railing on Michele Bachmann, and Sarah Palin, and lately Glenn Beck, says something interesting, or at least out of character. Case in point: This morning he popped up on Morning Joe for a Lent segment during which he strongly criticised America’s reaction to the Egyptian uprising and Obama’s treatment of Mubarak. Wasn’t [Mubarak] our friend for 30 years? Are we denying that?…[After Sadat’s assassination] we thought things might come apart over there and he held everything together. He was strong….and now we say it’s time for the game…Well we should have prepared this 20, 30 years ago. Where is the State Dept.? Don’t we have hundreds of people sitting over there in Foggy Bottom with no other job except to know what’s going on in Egypt…what are they doing? That was just his warm-up. After this he started taking aim, sparing neither Hillary Clinton nor Obama, whom he accused of being “chillingly” transactional instead of relationship-y. I watch Sec. Clinton today. I don’t get anything. I see anything more than two and two are four. I keep waiting for five. Show me you’ve done your jobs over there…I feel ashamed as an American at how we’re doing this…what have we done as leaders and as friends? All we’ve done is watch. That “shame” is rooted in the fact that Matthews thinks of Mubarak as a friend of America. It’s also rooted in a certain naivete over the role of the State Dept., namely to protect U.S. interests, not be “friendly” to dictators under siege from a nation tired of poverty and suppression. And backing Mubarak right now against a very young (population age-wise) nation presumably would leave America more vulnerable to attacks, not less. But his point about the State Dept. not seeing this coming is well made. What are all those people in Foggy Bottom doing? Presumably we’ll have to wait for a future memoir on the subject. Video below. It’s on the long side, but on the upside he doesn’t once mention Sarah Palin, Glenn Beck, or Michele Bachmann.